Though I've had this finished for what seems like ages, I had to wait until the birthday party to give it away to be sure I wasn't going to ruin anything. You've seen bits and pieces. I think I may have even shown the top, but here is the whole thing. Finished. We were having trouble getting a good photo on this day as well. It was windy, but sunny and that doesn't mix well with a quilt and the black-backgrounded fabrics. But at least I remembered to take one! I really love those I Spy circles. You did a great job. I am sure he will be ready to snuggle under it when he gets sleepy. That turned out so wonderful! Ethan may have been more interested in other gifts at the party, but I'll bet he will love snuggling in it by morning! It is perfect for a little boy! What I like also is that he won't outgrow it any time soon! ---"Love"
It looks great! 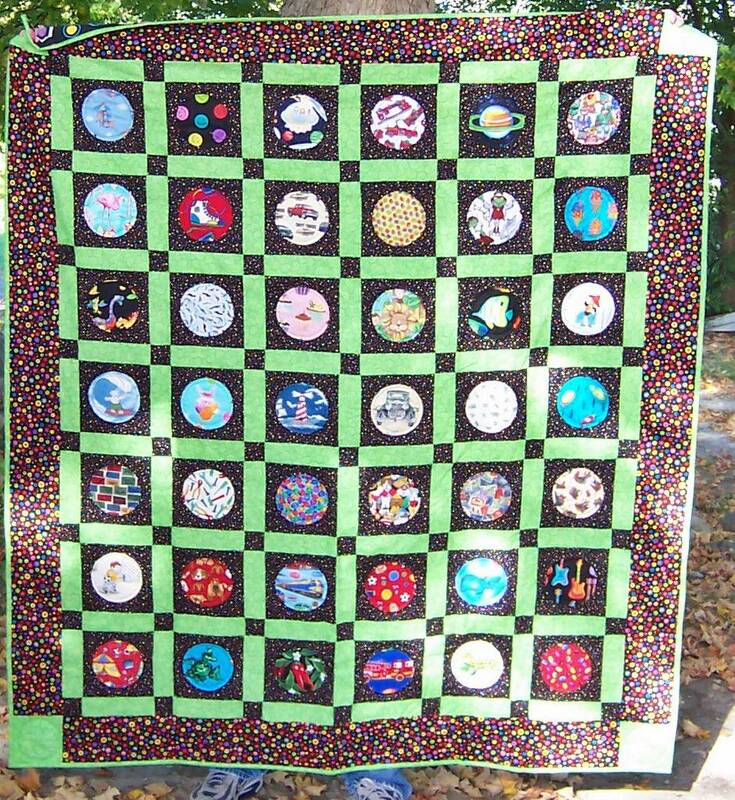 I'm thinking of making an I Spy quilt for one of my grandsons. I have to start looking for cute fabrics. One of the quilt shops I like has a basket full of squares of different fabrics. I might go rummage through it to see what I can find. Oh, I really like this! I know what you mean about sun, wind and black backgrounds. I'm still not happy with my pictures of "Don't Panic". The picture just doesn't do the colours justice. Love it! Ethan is a typical little kid, LOL! Would rather play with the boxes than what is in them. Sounds like a typical boy. 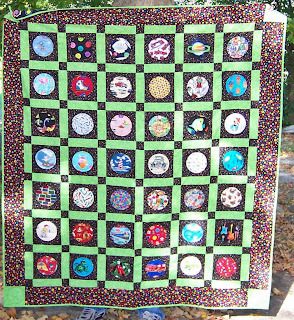 Eventually he will love his quilt when it is time for a snuggle and a story.